The 2018 Mercedes GLA 250 nestles into an ever-growing segment of small CUV’s, commonly referred to as cute-utes. 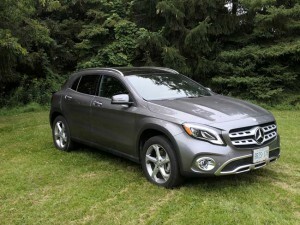 The Mercedes Benz GLA was first presented in 2013 and went on sale the following spring as a 2015 model. The 2018 Mercedes GLA tested reflects a mid-cycle refresh — it debuted at the 2017 North American International Autoshow in Detroit. The reworked GLA 250 receives new front headlights and rear taillights along with refreshed fascias. New wheel choices and a redesigned rear diffuser round out the visual changes. The refreshed exterior design is, perhaps, the strongest selling point of the GLA. Based on the CLA sedan, the GLA manages to capture the curvaceous sedan, but in a seductive compact crossover shell. The Mercedes GLA 250 is powered by an inline turbocharged four-cylinder engine that pushes 208 horsepower and 258 pound-feet of torque. The engine is mated to a seven-speed dual clutch transmission with paddle shifters on the steering wheel. The GLA is only offered with M-B’s variable torque 4Matic all-wheel-drive system regardless of trim level. As one would expect, the Mercedes 4Matic system is like most systems found in urban crossovers — adequate for city and light rural application, but not designed to challenge heavy off-road situations. The GLA offers a set of driver chosen vehicle settings — Eco, Comfort, Off-road, Sport and Individual. Each adjusts the driving characteristics to accommodate the situation. The Sport setting not only sharpens the throttle response, it also tightens the reaction of the electro-mechanical steering. The off-road mode relaxes throttle response and steering response to prevent overenthusiastic responses to a change in terrain. The GLA has decent ground clearance of eight-inches, yet getting in and out was pretty easy with seats mounted low to the floor. 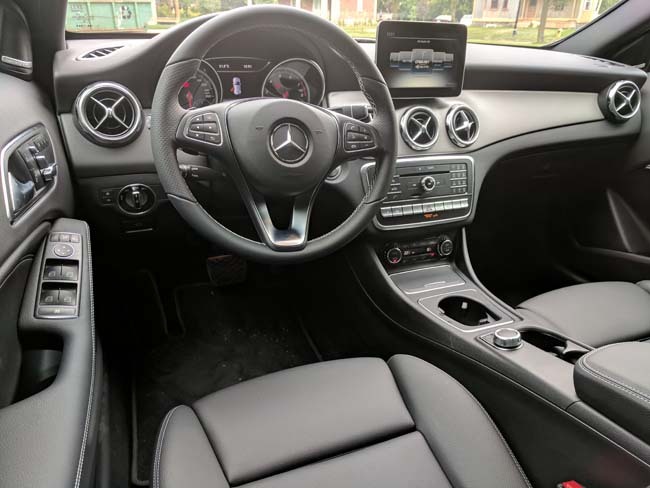 Inside the cabin, there is an unmistakable feel of Mercedes. Visually, the cabin is dominated by the optional 8-inch, centrally mounted LCD screen (a 7-inch screen is standard) that’s mounted amidst a row of large round air vents. Seating is clad in Mercedes-Benz’s Artico, a proprietary synthetic leather. A 12-way adjustable driver’s seat with heated surfaces for all passengers is standard. An optional panoramic sunroof helped to foster a feeling of spaciousness. Aside from the visual appeal of the GLA, working around Mercedes approach to the cabin functionality took a bit more than expected. There are plenty of buttons under the dash mounted LCD screen, however, I never found out how to adjust the audio tone controls in the week I had the vehicle. Also unusual is the placement of the shifter — a stalk on the right side of the steering column. Included on all GLA’s for 2018 is a back up camera and an optional feature is a 360-degree visual system for parking and such. Normally such external monitoring systems would seem redundant on a compact vehicle, even a compact crossover. However, the high belt-line and curvy sheet metal on the GLA do create some sightline issues, so the extra eyeballs proved to be appreciated when backing into tight a spot. Time to drive. Poke the keyless start button and the engine fires up. Slipping the vehicle into drive automatically disengages the electric parking brake and we’re off. The first impression of Mercedes-Benz GLA 250 was that acceleration seemed pretty anaemic. After the first leg of driving, I realized the vehicle had been set to Eco-mode and the lethargic behaviour was in an effort to save fuel. Switching to regular, the GLA performed as one expects from a European vehicle — crisp acceleration and tight handling. Overall the ride was pretty firm, again, what one expects from a European vehicle. Nowadays more expensive models come with magnetic ride dampers, but at this end of the price scale a firm suspension is par for the course. Driving proved quite pleasant with the Artico clad seats proving supportive and comfortable. After some time in the GLA, I was left wondering if it was really a crossover and not a raised up hatchback version of the CLA. Either opinion comes with pros and cons. The truth is the GLA is a bit too small to be considered a utility vehicle, at least for a family of four. The GLA may be ideal for one or two people looking for a light-duty hauler. Moving something like a small chair requires both halves of the split folding backseat to accommodate it, and then only barely. The low roofline also affects the cargo’s usefulness. A low seating position further reinforces the feeling of a raised hatchback more so than that of a crossover. However, that’s probably what makes the GLA so appealing. What do modern CUV buyers really want? Less than one percent of the typical buyer base is going to try off-roading in a new crossover, much less one this size. Most buyers look for the potential of utility and mostly with the impression that a crossover is somehow safer. 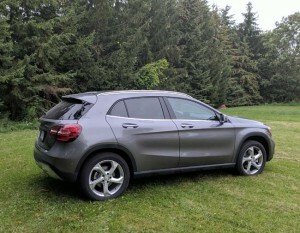 The truth is the GLA offers all the key points buyers are looking for in an urban crossover — increased ground clearance and a tall-riding view of the road ahead, all-wheel-drive, loads of safety systems and equipment, as well as technology and connectivity. What’s not to like? The ability to buy a Mercedes-Benz, albeit a base model, for $38,500 would seem to be the icing on a tasty cake. Attractive options and packages will take the price higher quickly, and have the salesman smiling.